We have noticed a steady increase in the amount of parents coming in asking for advice for their little ones. There is more awareness around supporting children’s health naturally. Social media and information on the internet plays a large part in this. Other considerations are that there is more of a predisposition that young children are facing now due to environmental and dietary factors. This, coupled with more research and interest in natural products, has led to a rise in natural recommendations from healthcare professionals e.g. doctors, midwives etc. We find that many parents are asking about homeopathic remedies, avoiding immunisations and looking for natural ways of supporting their child’s immunity. We often get asked about skin conditions, digestive issues and increasingly parents are coming in to seek advice for serious allergies in very young children. A great way of getting children interested in food is through educating them in a fun way and cooking together. Try to encourage children to eat a nice balance of vegetables, fruits, protein and complex carbohydrates. Enjoy good quality treats, putting emphasis on the fact that a treat is something to be enjoyed on occasion and celebrated rather than a given. Try to cook healthy, tasty food in bulk, for example in a slow cooker. This will help to limit the amount of processed food in their diets but will also make things more manageable for busy parents. Use good quality vegetables – organic wherever possible. Keep children hydrated as best you can, water being the best source. You can jazz the water up with frozen slices of fruit and frozen berries to make it more appealing. Hide vegetables and herbs by blending them into sauces. Try to get children into fresh fruit however you can, for example fruit kebabs, in porridge, with pancakes. Encourage them to eat nuts and seeds if you can; these can also be hidden in soups etc for extra protein and nutrients. Make sure they are getting plenty of fibre-rich foods. Eating a rainbow of colour allows a good variety of different antioxidants and nutrients. Try to avoid artificial colours, flavourings and sweeteners. Remember that exposure to bacteria is not a bad thing. Try not to be too sterile as this is key to the formation of their immunity. Support their immune systems by starting with good gut health. Probiotics can be used from birth and are a great support for gut health and immunity. Get them out in the sunshine as vitamin D is incredible for children’s immunity and bone health. Children have higher requirements for certain vitamins and minerals and some of these are hard to get through dietary sources. We would advise people worried about deficiencies to get their children to take a good multivitamin and mineral. Good options include Terranova’s Green Child Living Multivitamin, Higher Nature’s Kids Vital Vits and Viridian’s ViridiKid Multivitamin and Mineral. Other nutrients to consider supplementing with would be omega-3 as most children won’t eat oily fish or algae. If children are vegetarian or vegan, look at the possibility of supplementing with vitamin B12, iron and vitamin D. Lastly magnesium, calcium and the amino acid Theanine can help to calm the nervous system and promote sleep. Archie Browns is a thriving health food shop and vegetarian café and restaurant, with shops in Penzance and Truro, Cornwall. 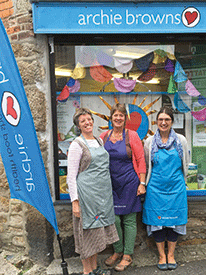 Fliss is the Truro manager and a long time vegetarian, with a keen interest in children’s nutrition. Beth is a CNM qualified nutritionist who works in the Truro shop. To contact the Penzance store, call 01736 362828, and for the Truro store call 01872 278622. The Truro store opened in 2009 and there are 40 staff members across both stores.